With its beach-style wooden bar, hessian cushions, beads, and quirky curios, Potli has a tropical street-bazaar vibe. 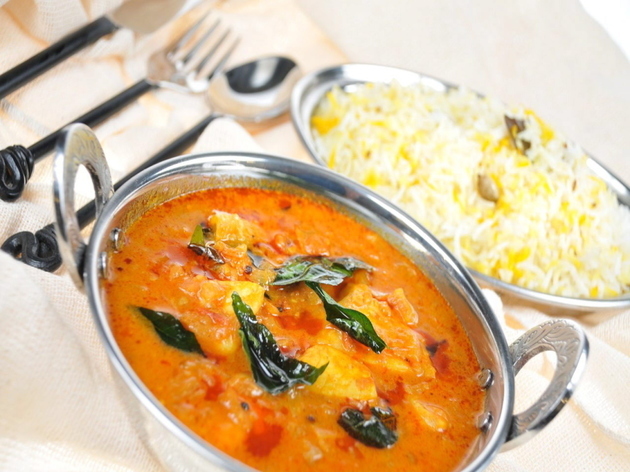 Local residents visit for the classic curries, smoky grills and generous portions. Banana-leaf packets, unwrapped at the table, revealed splendidly steamed Gujarati-style prawns, each cloaked in an outstanding coconut, coriander and green-chilli paste. Main courses tend to be rich affairs, with dishes arriving in bowls for sharing. Our curries wouldn’t have won awards in a beauty pageant, but despite their similar tomato-masala appearances, each had distinctive spicing. An enormous rogan josh lamb shank (enough for two) was supremely tender, and sauced with a gelatinous caramelised onion masala spiked with citrous cardamom. Sadly, goan pork vindaloo, although containing tender pork belly chunks, was let down by a flat masala and needed a kick of chilli and vinegar to lift it from mediocrity. It’s good to see Meantime Pale Ale on the drinks list – a marvellous match with all things spicy. Despite occasional slips, Potli is a great place to enjoy a relatively inexpensive meal. Its chefs excel in putting unfussy, homely meals on plates. It’s difficult to stand out in London as a curry house so I thought it was in interesting place to host a party. Once we found it (across the road and down a bit from where the normally reliable Citymapper directed me) we were treated to a delightful very long lunch with Indian food I’d never even heard of, in spite living in the South Asian capital of London and have travelled in India – twice! My mouth is actually watering as I write this and the only annoying thing is my taste buds were so engrossed in the pre-ordered exotic, subtle and quite frankly inspiring mixture of flavours and textures I forgot to ask what it all was, darn it. Reckon this could be one of those amazing places you go to where you let the waiter know your general preferences and just let him go off-piste with your choices. It almost makes you feel as if you’re travelling through Gujarat rather than in a random part of London, such is the pull of the place. Definitely on my re-visit list, even just for the impeccable service. What a restaurant this is! Tava machi, chicken tikka and lamb biryani are phenomenal, and you can be sure that each dish holds a different flavour and texture, not overly hot or spiced but seasoned to perfection. 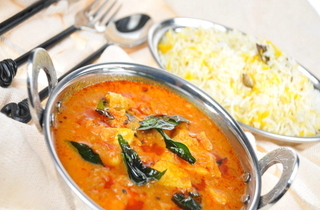 Potli doesn't fall into the trap of serving dishes that all appear to have come from the same vat of sauce or masala. The decor is gaudy yet appropriate and the ambience and music takes you back to a more classical time. Loved it. The Samosas were nice and came with a nice tomato based lentil sauce, yummy. You could really taste the dough but it wasn't as oily as your usual samosa. The mixed grill came with 2 shish kebabs, 1 lamb chop, 1 half chicken tikka, some pieces of chicken and some fish. All were good and cooked well but were all lacking a bit of flavour, seasoning and/or spice. And with the weird numbers no one had a full tastings. With that fiasco over and our party size then reduced mains were ordered. best indian food i've eaten in and out of india in many years. lovely cocktails too and very friendly service. go! I went to Potli last week & had a meal of my life there. Straightforward & high quality food. You can tell the difference between a regular Indian & this 'pot cooking' style. Every dish had a flavour of its own & the price for what we had there was extremely reasonable. I also enjoyed their innovative & spiced laden cocktails too. A must, will go back soon. Delicious. Lovely lunch. The lightest lemon rice ever. Very reasonably priced considering it was top notch Indian cuisine. Loved it.